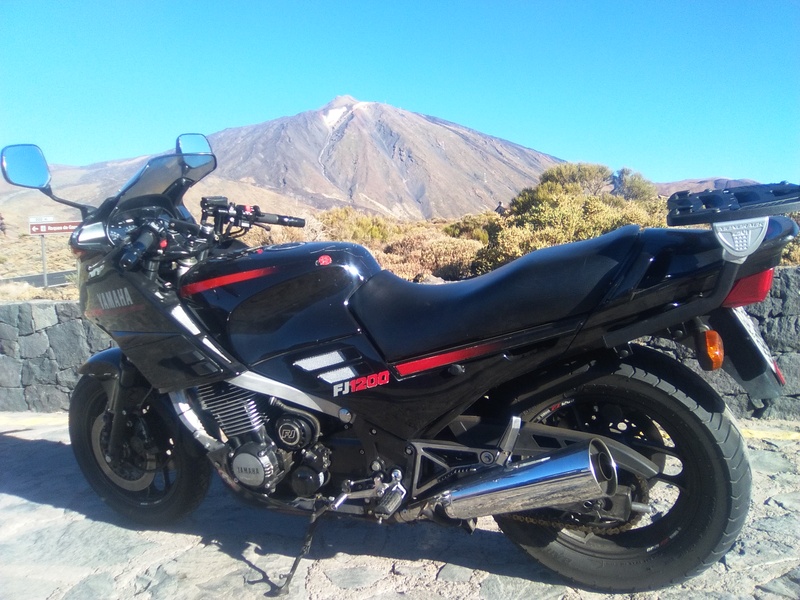 It is being more and more difficult to find a good, complete and proper maintained & working FJ 1100 or FJ1200 first series like this in Spain. It is possible to find 3CV or 3XW models in good shape, maybe because their owners were most tour orientated people, choosing their FJs like an sport-touring option and not like an hi-sport bikes, that we must remember that were the FJ market niche between 1984 and 1987 for the FJ. And the Spanish market was protected by import quotes and these FJs were very expensive then. Because of all of that, those first series are scarce now. There are good bikes, in perfect working order, but the owners, that I know a bunch, don't sell their beloved bikes. First rule buying second-hand is that the vehicle must be running habitually, better every day or week. Standstill motorbikes for more than a year and the carbs will leak (or worst, dry fuel that clog every hole in the carbs), dry and hardened guide valve oil seals that will cause your bike drink oil like a 2-stroke, fork seals leaking, brake & clutch fluid corroding all around after break the seals, and of course time out and deformed tyres and dry transmission chain that will collapse in a few km. even although the chain looked good at first sight. 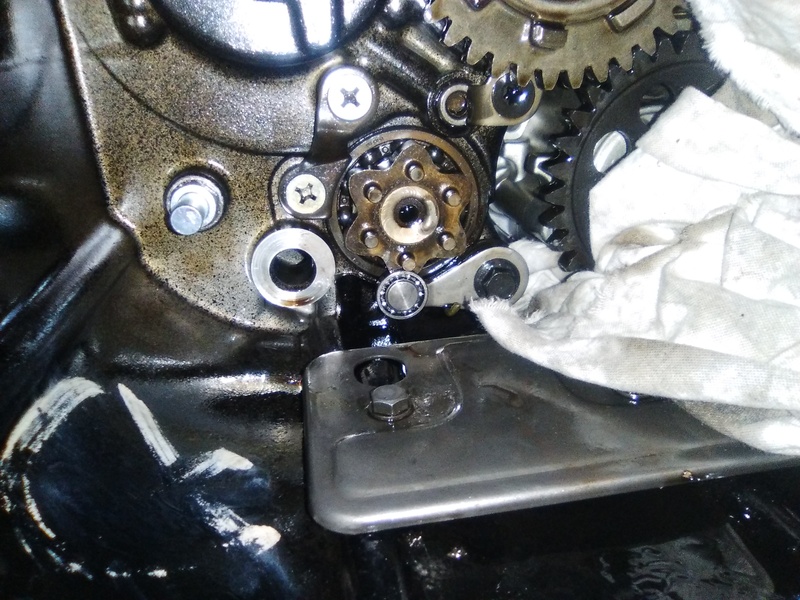 Additionally, the fuel could have destroyed the petcock, go to the crankcase through the carbs and drying and ruining all the o rings. So, basically I look for an FJ with a good engine running and with no necessity of painting, because it adds an elevated cost to the project. The example chosen could be well used, not perfect, because the bike is for refurbish and ride and enjoy, not leave it in an exposition or in a museum. And after a lot of search, my 1TX appeared. Restored carbs with the old parts to demonstrate, engine in good shape, good colour even not original, without the blue base (I like more), no corrosion in any place, visible or not, rear shock in good shape and working, new battery, transmission and tyres in good working order and a complete set of Krauser cases, an special seat and 2 different original Yamaha screens. 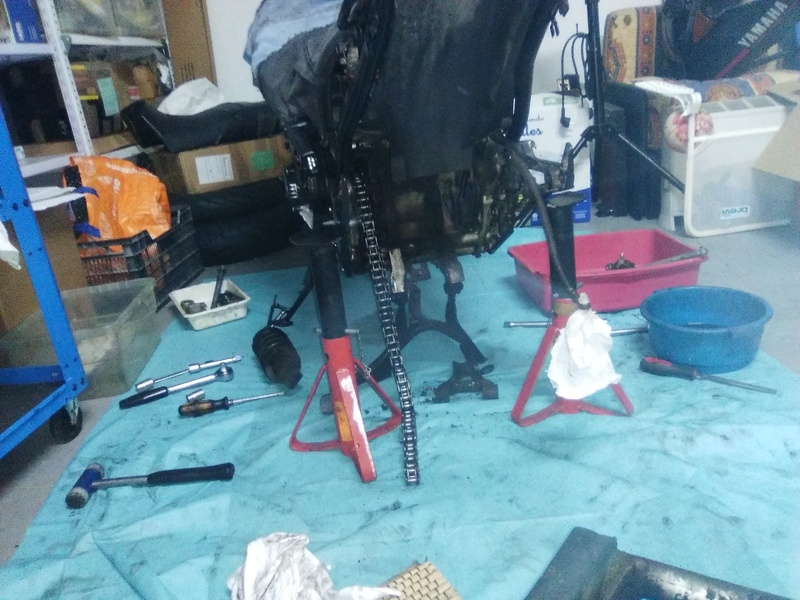 The bike was not perfect and had problems, basically steering bearings shot, pitted forks with leaking seals, antidives disconnected and the rear subframe had all the cases supports broken. But the brakes worked with a Fazer master and metallic hoses and oil and brake fluids just changed. The bike misfired low down, not maintaining the idle. 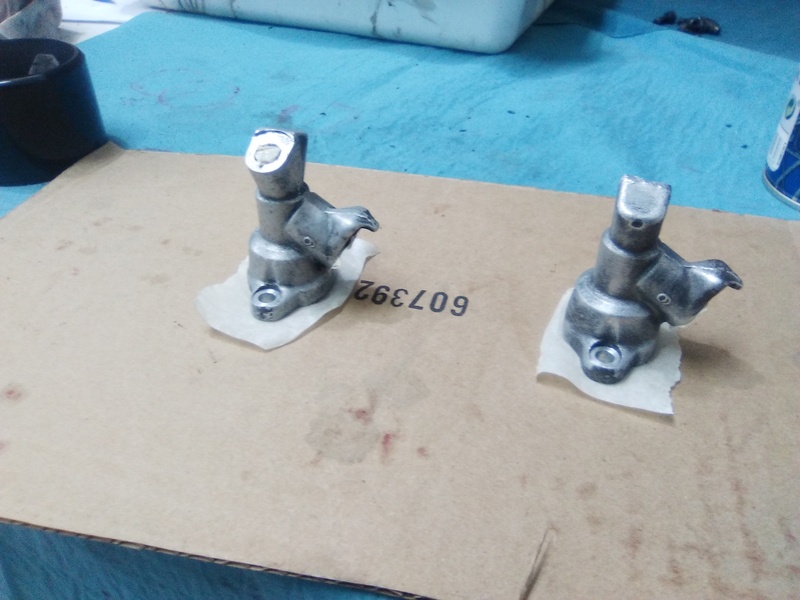 My friend JC and myself thought at first sight to the necessity of a good carburetion sync and to the bad quality Tecnomoto cans, already poor even new, and even worst with holes and spray canned painted, in conjunction too with a 30 years old coils and wires. 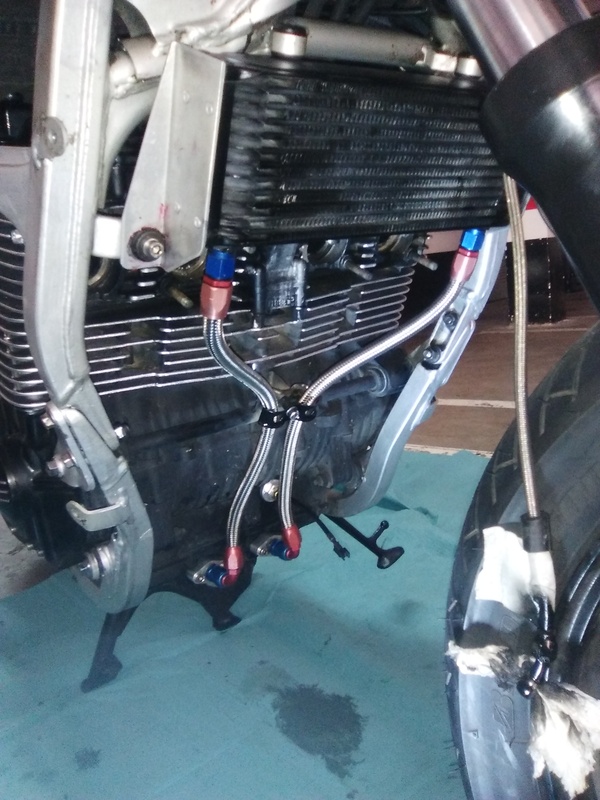 But apart of those problems, the engine felt powerful, the gear change was (and is) the sweeter than I've never tested in a FJ (take a look at the trick at the engine section) and the bike was complete, without nothing too broken. The owner said that something sounded inside, but we never listen anything. Maybe he listen the distribution chain due to the bad idle and carb sync. 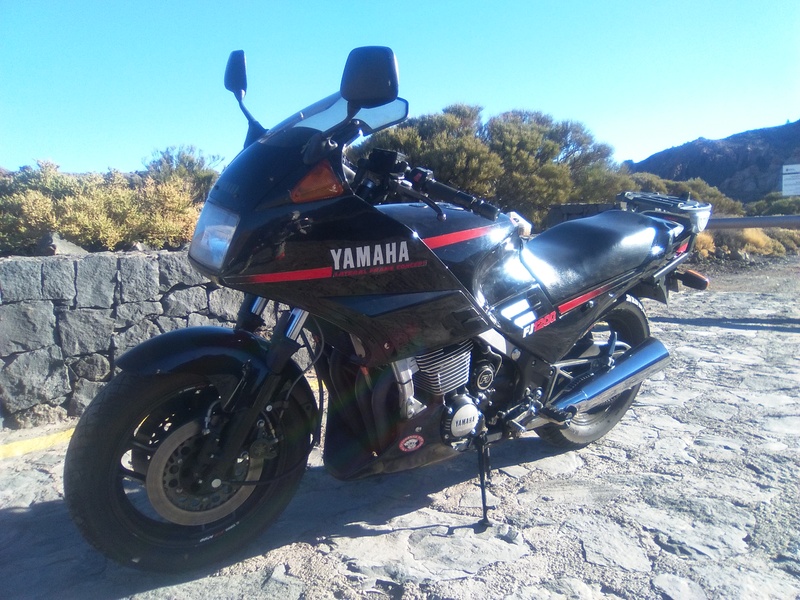 And the price was according with its state, that the former owner described like "I would not travel with this bike to the next street corner", so very cheap. In fact, or I bought it or the bike was going to be parted out. 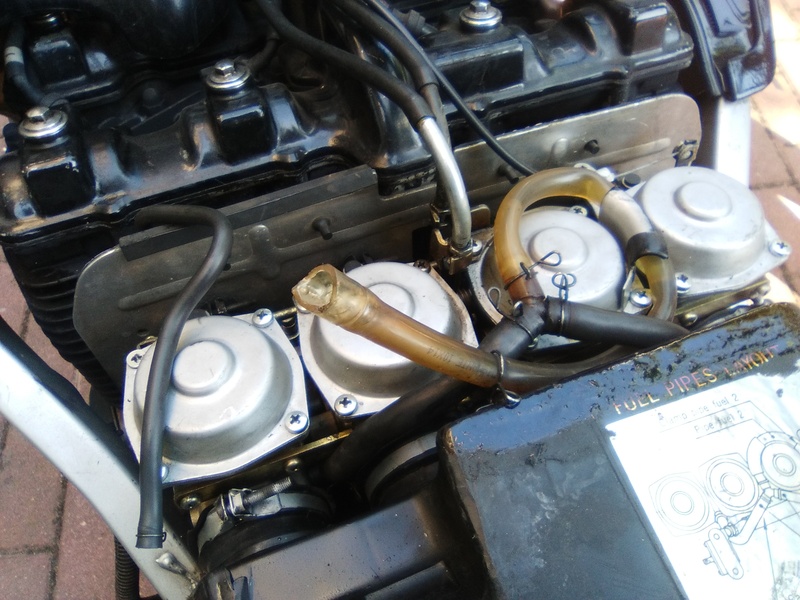 When we dismounted the fuel tank to sync the carbs in Madrid, we saw that the bad slow speed riding was due to the HORROR shown at the pic: plastic tube was replacing the OE fuel tube. The engine heat had hardened the plastic and the tube was cracked and losing fuel, splashing all around the hot engine. And the fuel tank had no thermal insulating glued. Perfect to make a good barbecue! 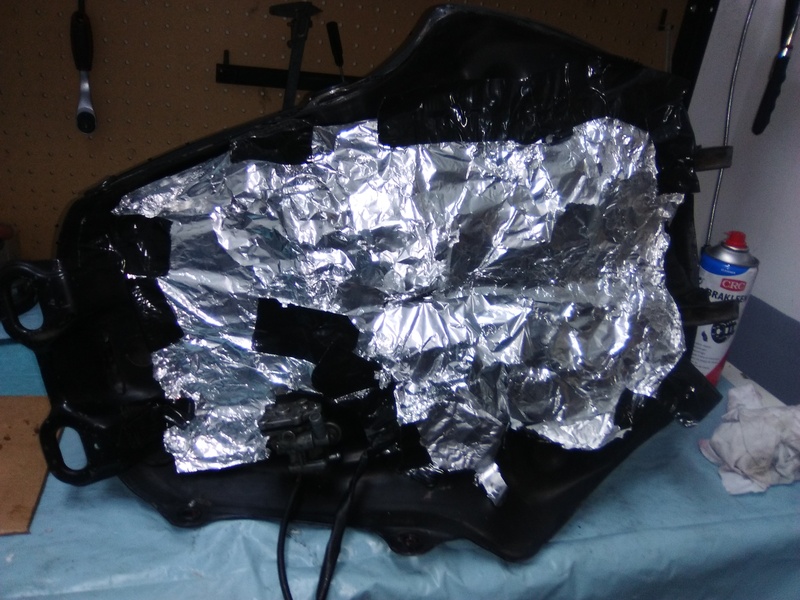 So after the fuel line change (explained below), improving an insulated shield with sheets of aluminium paper (pic), a little revision and check of all the bike (included steering stems bearings and fork oil seals), extirpated the Tecnomoto cans and fit a pair of XJR cans bought as fast as possible in UK, I rode 4.000 km on the bike in my holydays, not bad for a bike that it was going to be dismantled, and came back home in Tenerife to make a complete refurbish. And the 4.000 Km. were not a simply a quiet ride, so the purchase was a success. 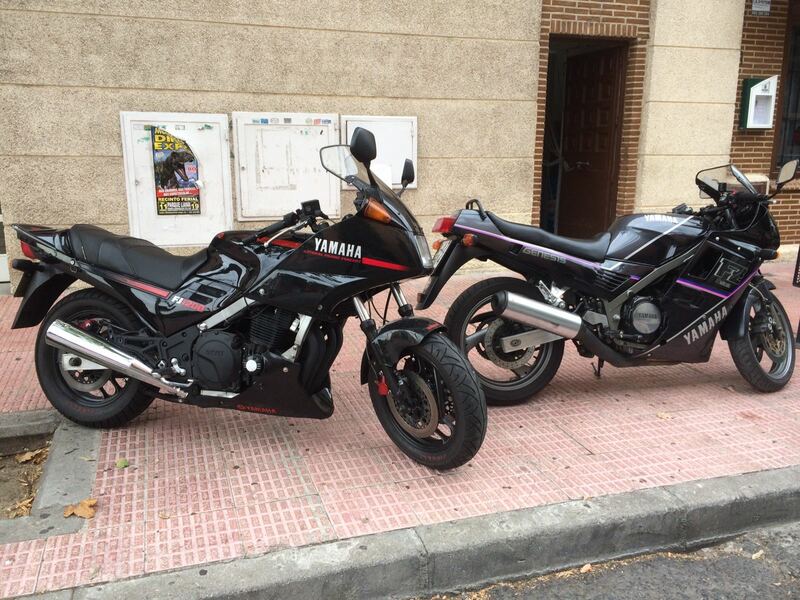 And I could assit on the bike to our annual FJ meeting in Madrid, enjoying a fantastic day. On a 30 years old electric wiring is a good idea check and open every connection and the discretional use of dielectric grease. 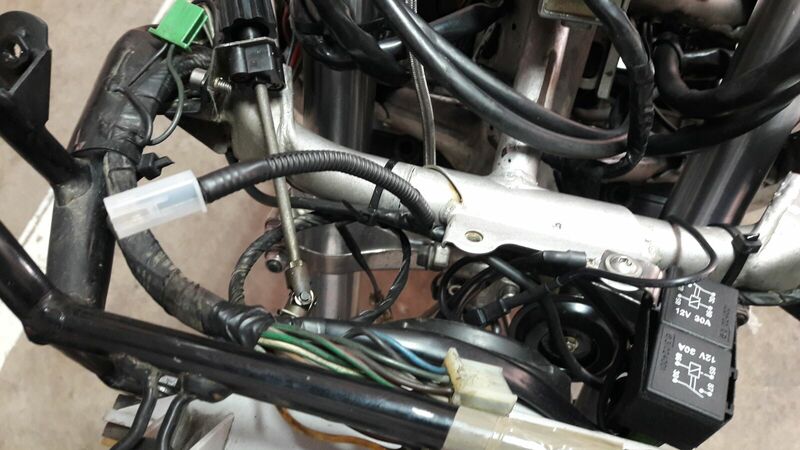 And in my bike, I had to guide the wires by their original position and remove a redundant fuse installation that I don't know why someone had installed. 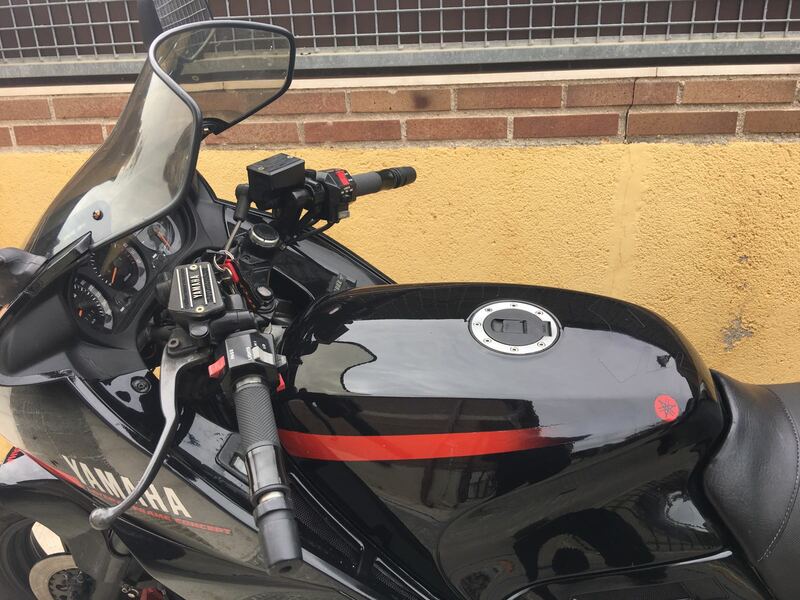 An oil temperature/clock/voltmeter gauge of low quality was fitted on the bike, and it has been replaced with a KOSO digital oil temperature gauge. 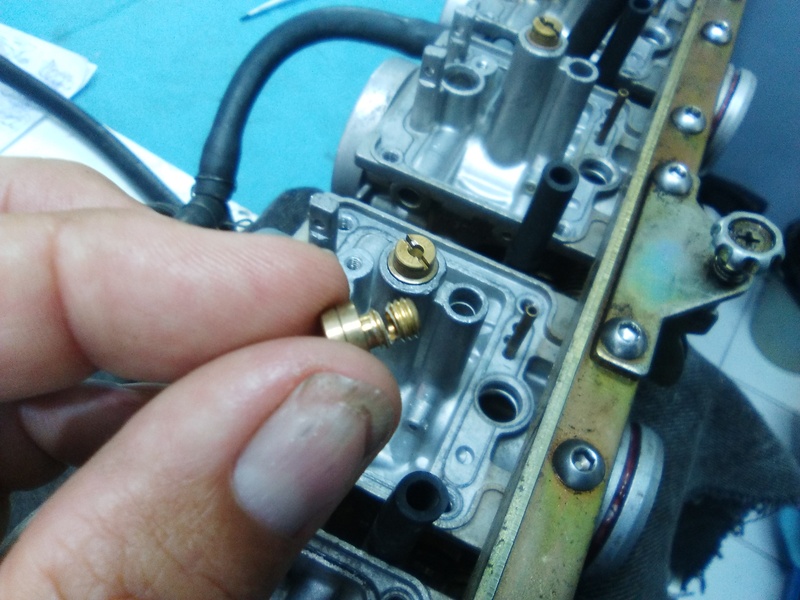 To improve the quality of the spark in the plugs, 1mm of the coil wires was cut just on the spark plug cap connection to remove the habitual oxidation here, and made the coil relay trick as described at the website. When performing this mod, I confused the relay and when I started the bike it run only on 2 cylinders. I had to re-dismount and refitted carbs again prior to notice my error. I've installed XJ900 gauges inside the FJ cluster, straight on mod. The rpm and speedo gauges were bouncing all the time (yes, this time the fuel gauge was ok). The only problem is that the XJ900 speedo stops at 240 km/h :)))) The XJ900 RPM clock shows redline at 9.500 rpm because come from a first series XJ. Newer ones have 9.000 rpm redline. The OE pathetic horn have been replaced, of course. As in mi 3CV, the headlamp have been improved with a relay, a dashboard light switch have been added and a practical gear indicator have been added to avoid the inexistent 6th gear pursuit on riding. A near new set of Pirelli Sport Demon were fitted on the bike when I bought it. A bunch of FJ owners fit these on Spain because are immediately available to fit the 16" rims and the price is low. On the tyres section my impressions are written. These tyres would be not homologated for motorbikes with the FJ weigh and power. The change to Bridgestone BT 45s was like a different and better bike. What a difference!. The shimmy reaction when crossing white lines on the road disappear. 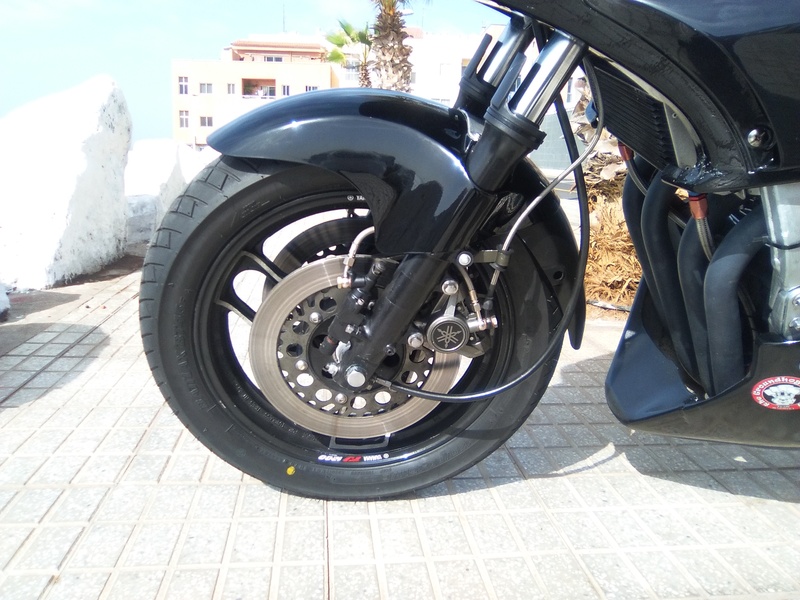 The rear tyre don't flex, like the Pirelli do only giving throttle in straight line... the general behaviour of this tyres are better than fitted in the narrow Honda CBX 750 rear rim. Even better, fit front Dunlop StreetSmart with an Avon Ultra 3D rear. Awesome! And the brakes work excellent, near the performance of my 3CV brake setup, like I know because of my friend Mingo's 1TX. 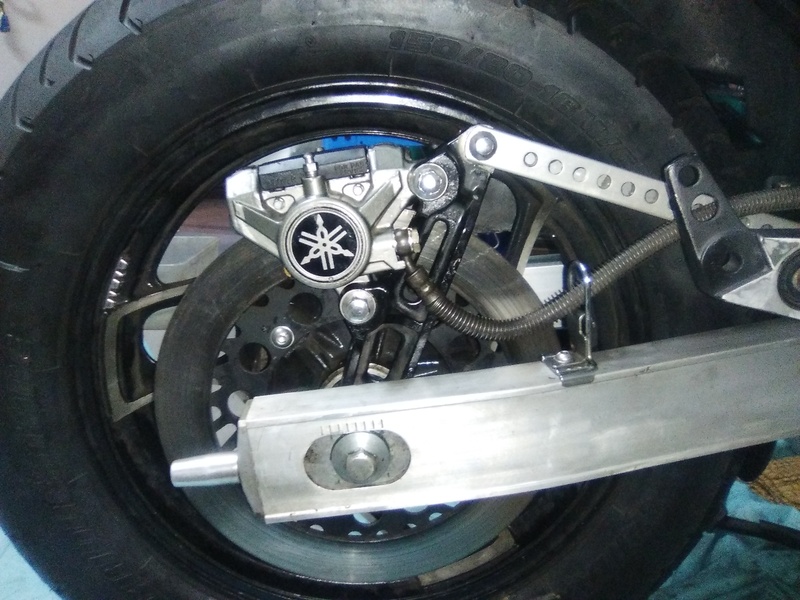 Perfect and clean callipers with organic pads, metallic hoses everywhere and ZZR 1100 brake master. (The sintered pads will eat this kind of brake discs). The antidives were disconnected by the simply way of eliminate the hoses to the brakes. 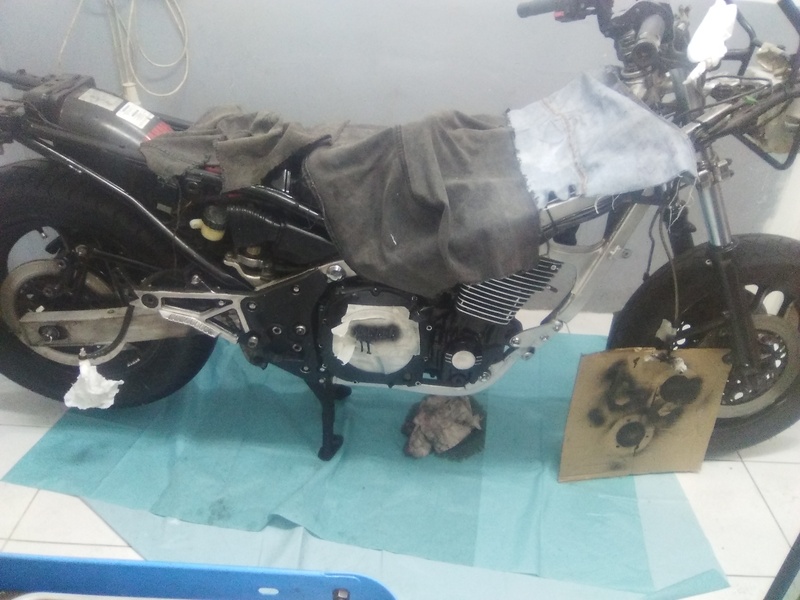 So in Madrid, at this moment, without the proper place & tools to disassembly, clean and repair, I left that way to ride on. 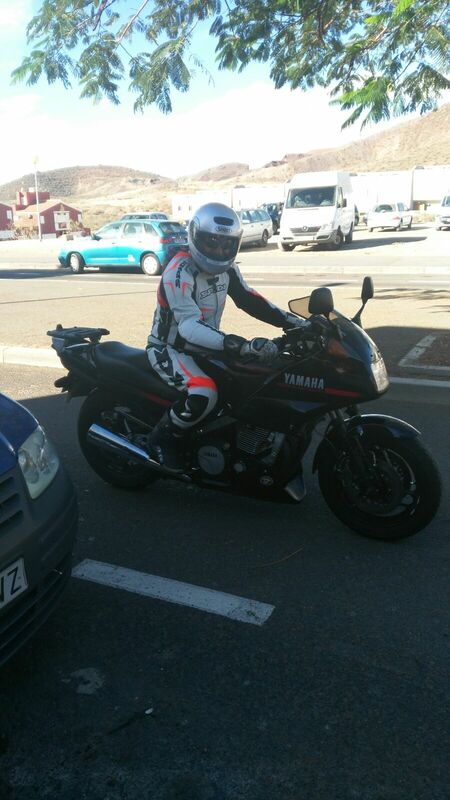 There were no previous test day before to face my travel: the first day that I rode on the bike I had 925 km. in front by secondary roads in Mainland Spain and Portugal. The bike feeling was like riding a buoy: upright, the bike was moving side to side all the time and inside a curve, the bike wanted to stand up. With new 10/40new oil inside the forks and good settings front and rear, I was disconcerted. The sensation were equal to setup the hydraulic compression too hard. But this adjustment is not available at the OE suspension elements, so it was even more confusing. 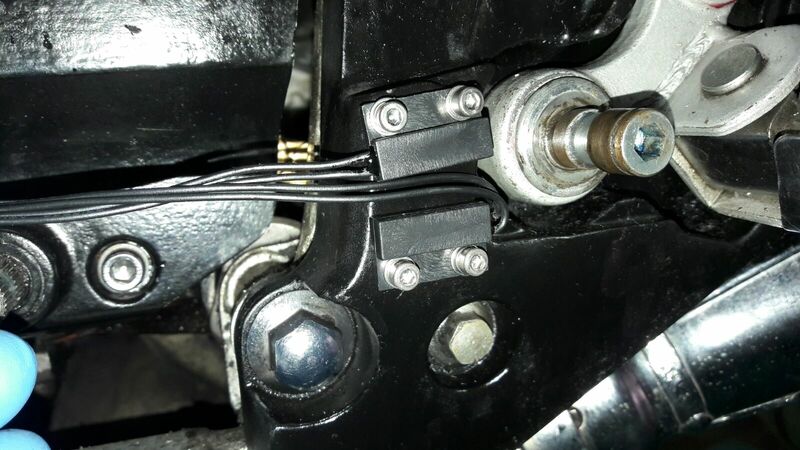 After riding around 150 km thinking and analysing the bike reactions, I stopped in Valdecarros (Ávila) in my inaugural 900 km riding day and checked the antidives adjustment, that remember these were disconnected. The hardest settings, both turn into completely, were selected. Thinking while riding, I had in mind that in the FJ forum www.fjowners.com was commented years ago that the antidives don't must be simply disconnected because work like and hydraulic compression adjustment too. So I turn out both anti-dive to their minimum setting and voilá!, the front suspension started to work properly and the bike, even with still the Pirelli fitted, recovered its straight line and open curves stability, at the same time that the flickability of the 16" front was present, go side to side only with your thoughts. At home the fork have been refurbished with double lip oil seals, with new internals. 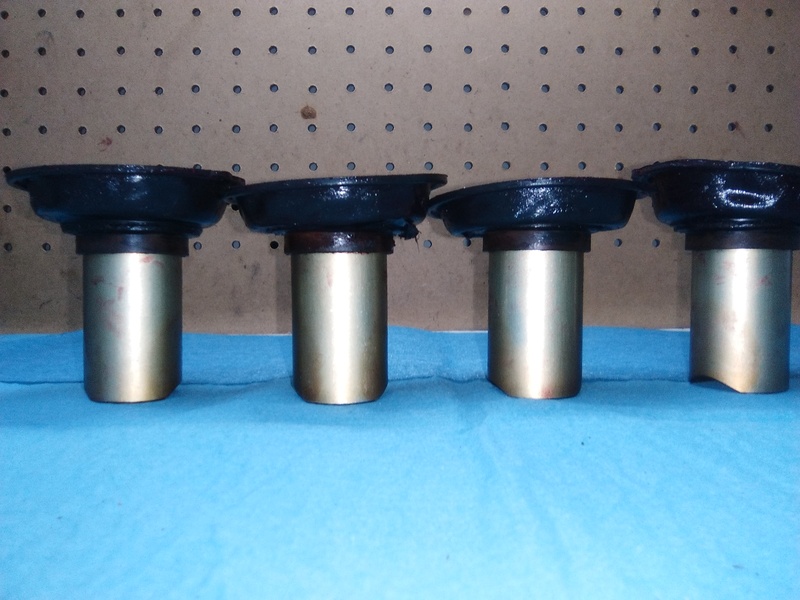 The bushes change is necessary to restore the damping and because too it helps to reduce the pressure on the oil seals, lowering the risk of blow these. The OE front springs are into the specifications. The quality is different and better than those fitted to the 1100 or the 1200 3CV, that even new are undersprung. 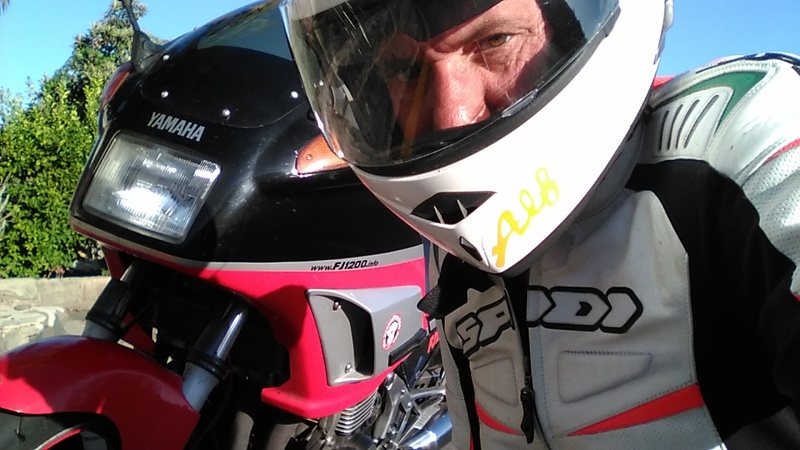 The always essential in my bikes KN filter have been installed and the HRC fuel cap trick done, essential in this FJ model due to its chronic fuel starvation between 1500 y 3000 rpm, that combined with an abrupt ignition curve at this range make the effect of riding a bronco bull. The carb components are std by the moment. When checked the bike in Madrid, we fit an 8 mm. fuel hose even it was a little forced mounted at the connections, but it was the only that we get with the urgency of the time. But to keep my peace of mind, I replaced at the middle of my travel with 10 mm. fuel hose. Problems!. The 8 mm. hose, being narrower is more rigid, even although both hoses are made of the same materials and have the same specs. The 10 mm. hose is stretched for the original hose that go by above restricting the fuel flow unless is fitted carefully, . The worst thing is that the original tube, reinforced, is discontinued, so there are no other solution that fit carefully the 10 mm. hose each time that we have to dismount the fuel tank. 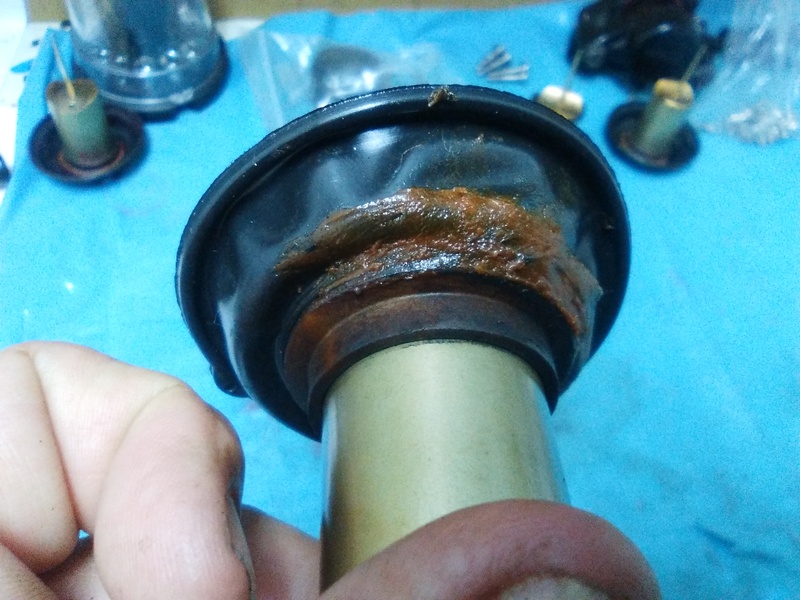 When dismounting the carbs I discover that the diaphragms are not original, and, worst of all, the workshop that installed the aftermarket diaphragms in the original slides broke 2 of them and glued with orange Nural. 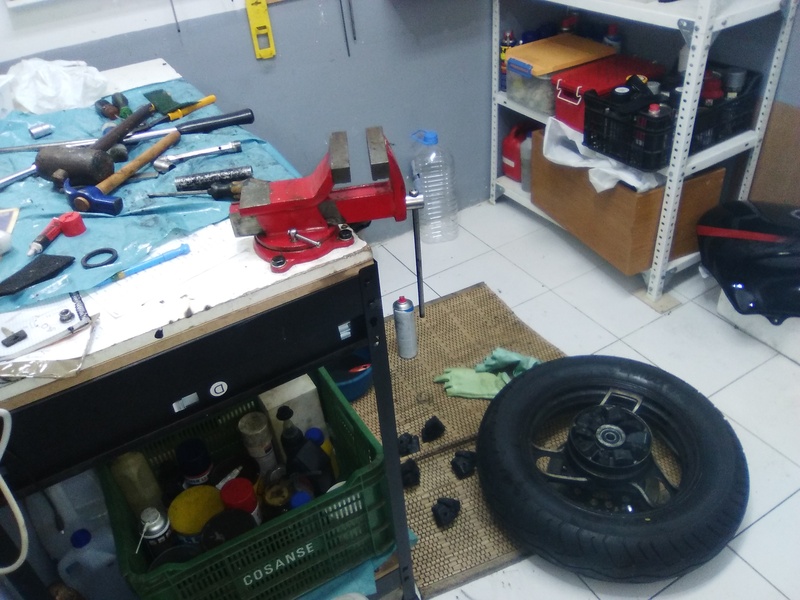 My bike ex-owner got very angry with the workshop people when I shown the pics. Plasti-Dip make wonders and miracles with the carb diaphragms and were perfectly repaired. There was a main jet broken. Its clear that was done when the jet was screw in. So the emulsion tube I think had movement upside down. I have seen never nothing similar. Even although with all this botched carbies, the bike spent 6,4l/100 average in 4.000 km, that speak about the engine good condition. And with no throttle mercy most of the time. With the bike finished, I observed that the engine temperatures were high even with the big oil cooler fitted at sport riding. With open cans and KN filter the jetting are a bit lean. The valve clearances were inside the specs. Little corrections were made in order of to obtain the best performance from the engine: setting minimum intake clearances between 11-12, and maximum exhaust clearances, between 19-21. So I adjusted 1 intake clearance that was in 16 and one exhaust that it was in 23. Three of the exhaust valves that were measured 21 were left untouched. 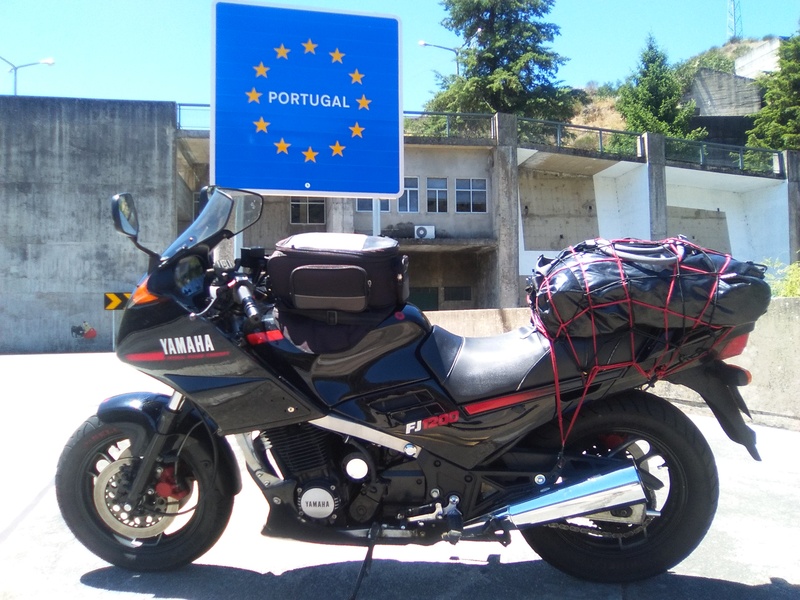 I live in a subtropical place with very tight curves and 22ºC average temperature near all year around, that translate in a very hot tarmac (the soil is volcanic) and very hot riding temperature with no too much air to cool the engine. So a bigger cooler is a must, hence when a second-hand RPM cooler with integrated thermostat opportunity emerged, I bought it, more when I was determined to purchase new. So it was mounted, with perfect fitment. It is a 13 row cooler, bigger than the 10 row fitted in my 3CV from the FJowners club UK. 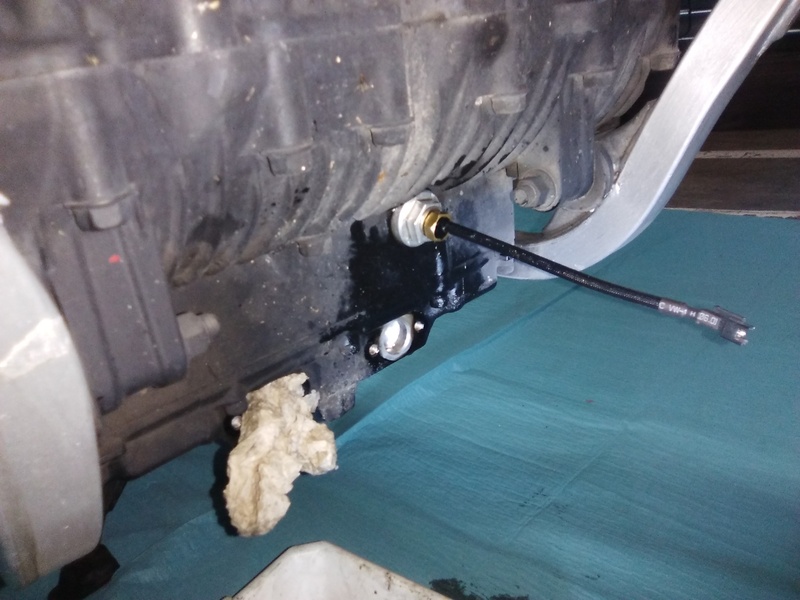 Too an RPM spin-on oil filter adapter has been fitted that let bigger filter be used and make the oil change a doddle and preserve the clutch hydraulic slave to blow the seals because it less exposed to road debris and it is more ventilated, so the temperature that harden the seal is less. 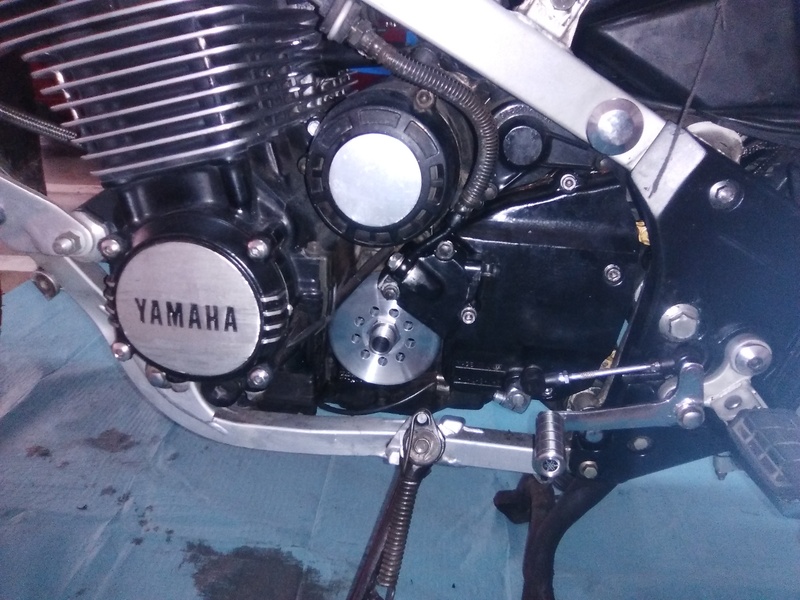 The clutch have been improved with new friction plates, the clutch trick and a ZZR 1100 D clutch master cylinder. 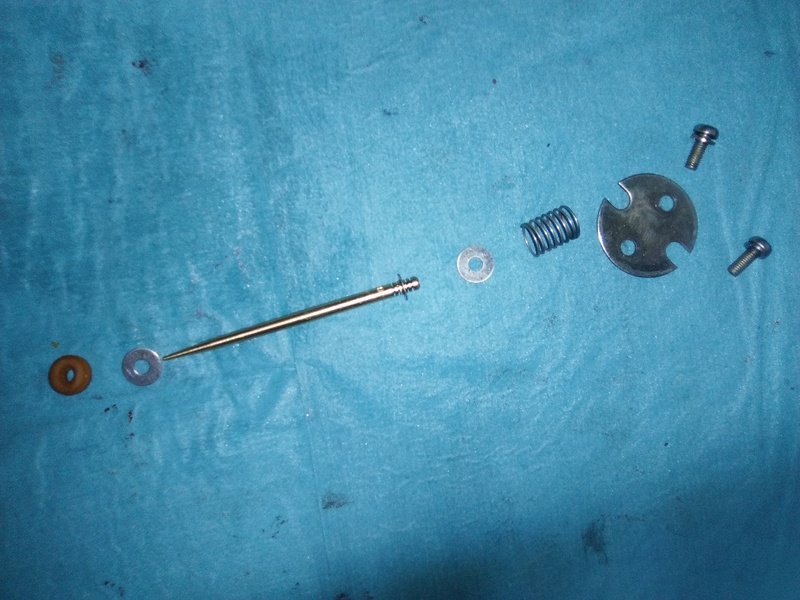 The gear change have been improved with a shift lever with a bearing inside the selector. 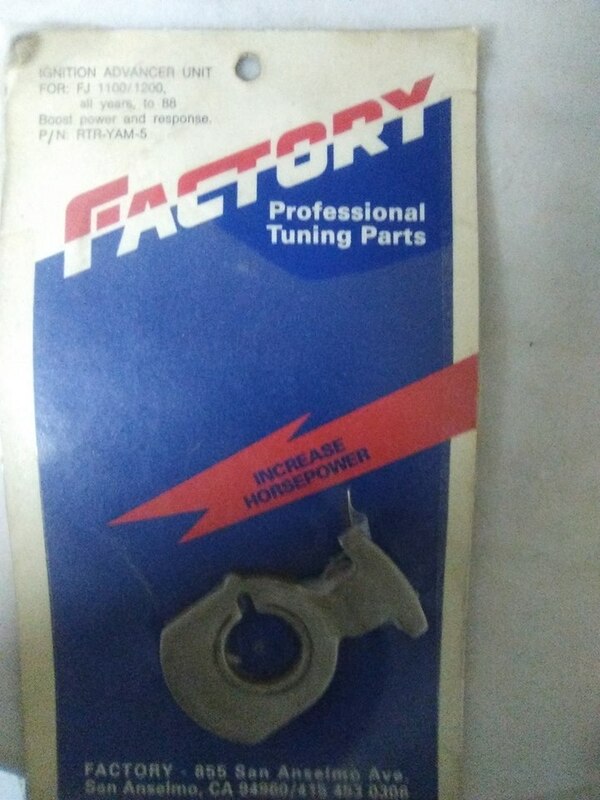 The gear change in this FJ is the best original that I've tested simply with the trick that I explain at the website, so I left the original spring at the shifter. 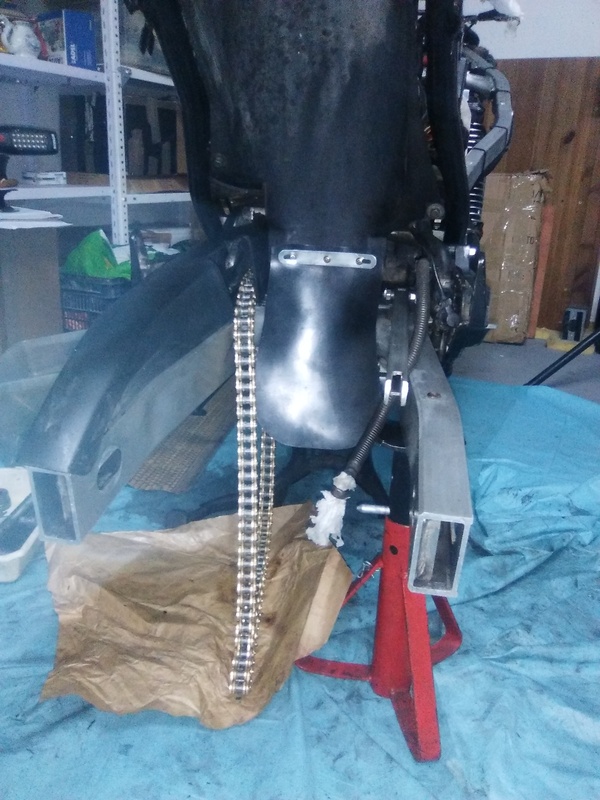 This part is for me the worst possible work to perform in our FJs: 30 years old of road grime embed in swing arm, dogbones, shock, inside the sprocket cover with chain grease and all around. It is a hard work dismount everything, clean and replace parts and refitted everything again. There was a little play on the rear shock bushes that were replaced and in the front bearings suspension arm. Surprisingly the rear shock is in excellent condition. 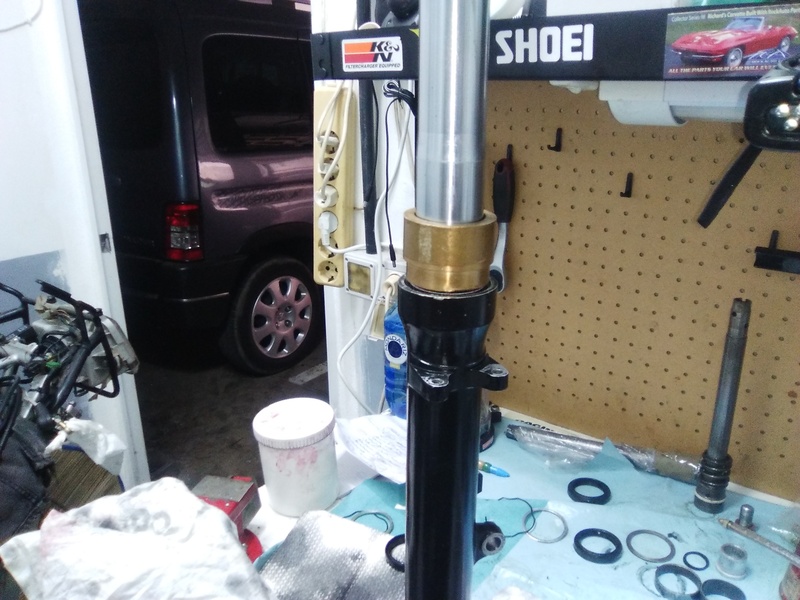 I've found good shocks in 30 years old FJs and another shots in near new ones. I've concluded that the quality of FJ shocks vary this way: FJ 1100 shocks were bad, 1TXs good, 3 CVs bad but very good if a replacement is bought, and good on the 3XWs. I moded the shock with the rear spring trick to gain 2 positions. Spring and hydraulic dialled at original 4th position is perfect to suit my weight, but with the spring mod I gain 2 additional positions to carry passenger and full luggage. I have to advice that sooner or later I will fit an YSS shock. 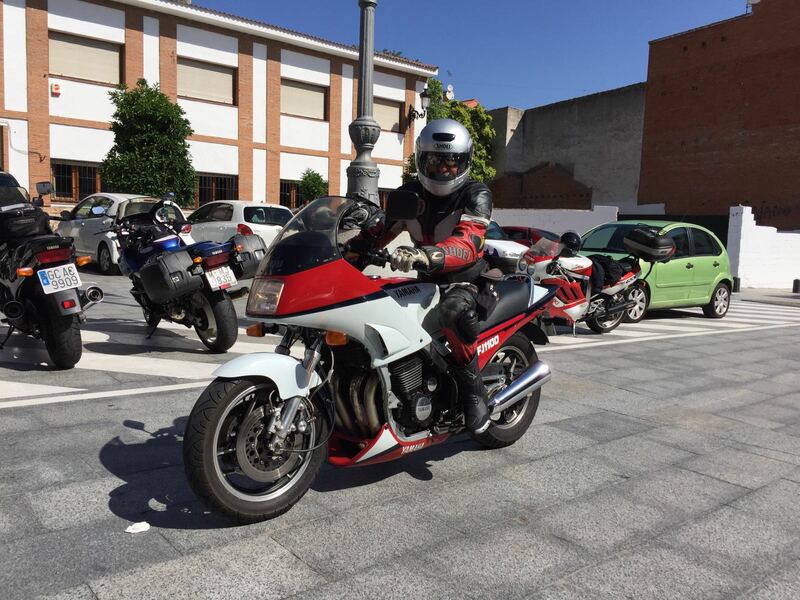 Apart from the excellent one that I fitted to my CBX, I tested the perfect handling FJ 1100 of my friend Javier and it is superb, making the bike like a toy, compact, stable, sporty and intuitive to ride... even with the infamous Pirelli Demons fitted! 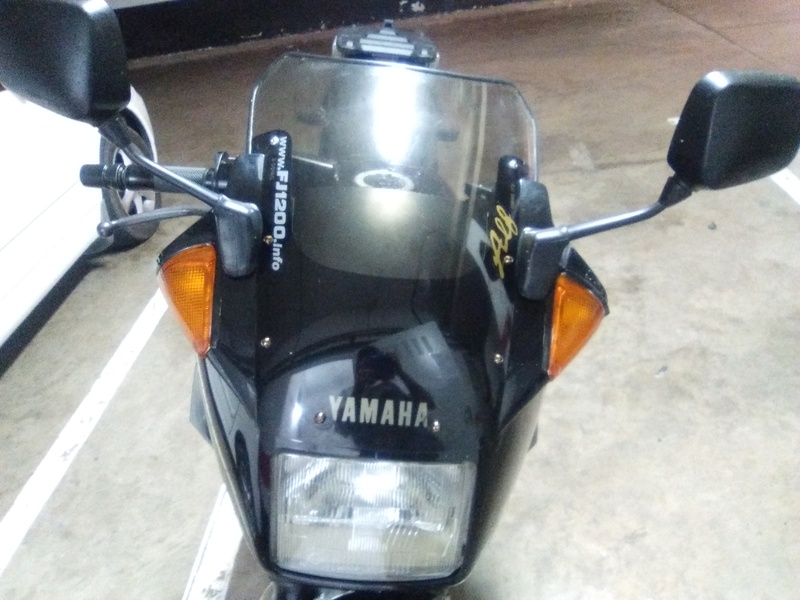 2 OE windscreens were included on the bike, both Yamaha originals: 1 standard and 1 longer, in option in some countries. At first I thought about selling the high screen, but is fantastic! Nothing similar to the aftermarket flip-up ones. When riding in the air bubble created by the high screen it is clear that the work at the wind tunnel was well done: without noises, turbulences or instability at high speed, 240 km/h plus showing at the speedo. Simply perfect!. 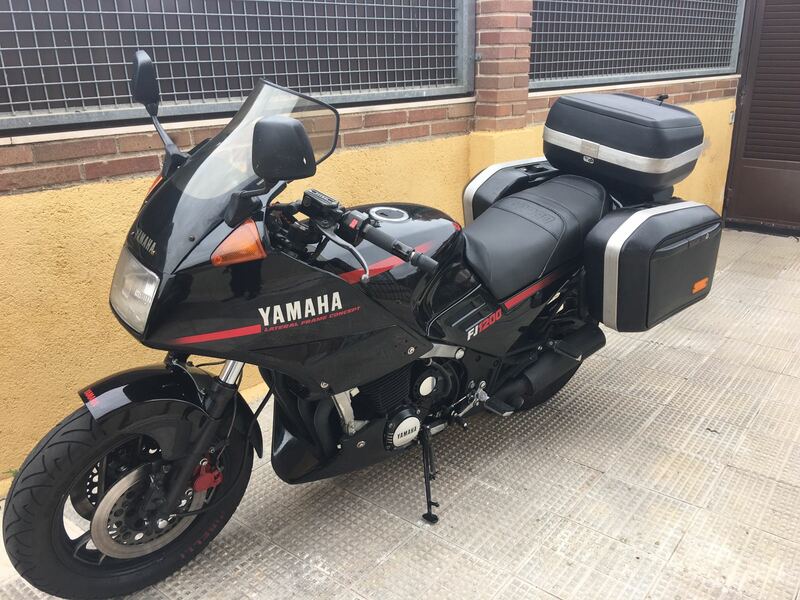 So I keep it to travel to Mainland Spain or Europe in summer, because the sum of the high screen, comfortable aftermarket seat and BIG tyres with high profile to absorb road irregularities make a wonderful sport tourer, to ride hundreds of kilometres without effort, day by day, just like I travel on holydays. Between 160-160 km/h the sensation is like you ride at a relaxed, safe & comfortable speed. When at home and dismounted all the bodywork, was meticulously repaired with sika-flex. This product formulated for building construction give a hard glue composite when dry, being flexible at the same time and letting using sand and being painted. 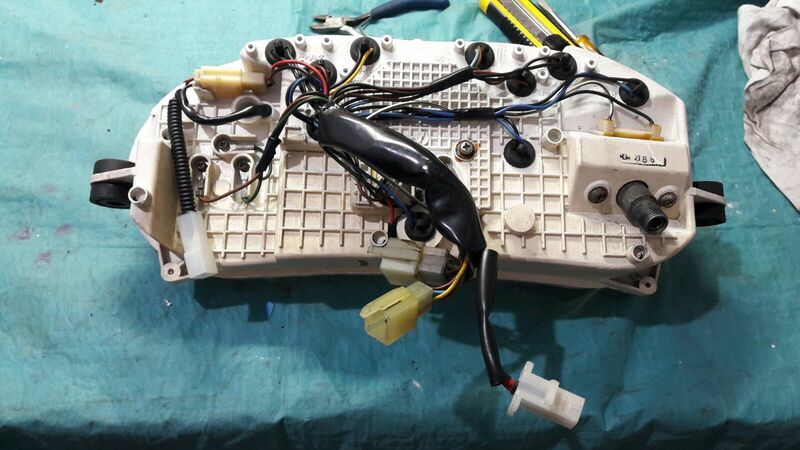 Of course all the screws were changed and remounted with Teflon shims to protect the bodywork and avoid vibrations. The front mudguard had been cut, far away of any possible restoration, so was changed. And the clock surround, impossible to find new, was made from 3 partially broken ones that I got. 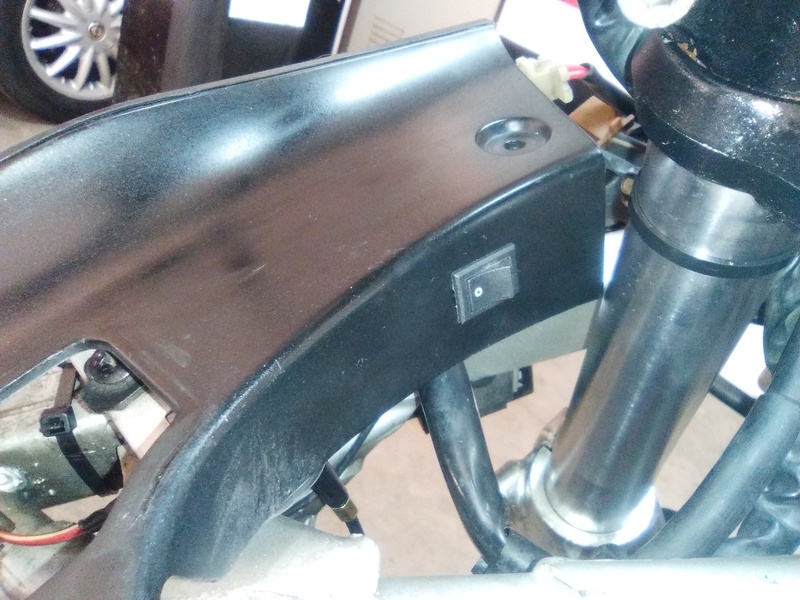 The rear subframe was replaced with one in perfect shape and painted. I'm still considering about a complete paint. The bodywork is not in bad shape and at the beginning I thought leave as it is because I like an air of time "patina". But when I've finished the bike, seems like a new bike with an old bodywork on. On the other side, the bike is being ridden and it is a pleasure to do this, so I am not too motivated to disassembly again. So by the moment, it stays like this. Each nut & screw have been revised, cleaned and most of the times, changed for quality SS ones, all the bearings replaced for the best quality available ones, Teflon & neoprene shims fitted all around to avoid vibrations, completely greased where needed and changed everything that it was ugly, corroded, mismatched or broken. Everything with care to make myself a special motorcycle. And, how much the "invention" cost? Well, it is a caprice, I own my fantastic 3CV, so there was no a previous estimate budget. Nothing have been bought because was cheap, getting instead the best quality components needed. 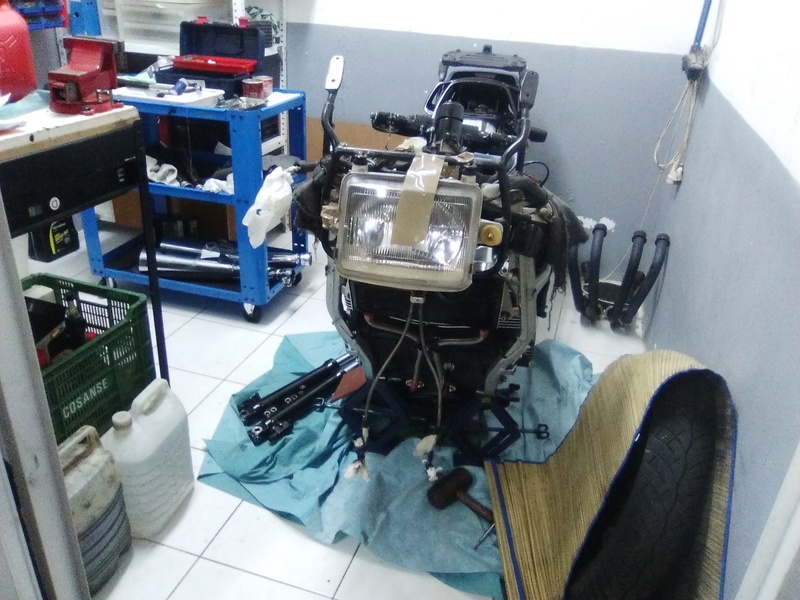 The total expense is 1.800 Euros in parts, plus the bike cost plus 120 labour hours. 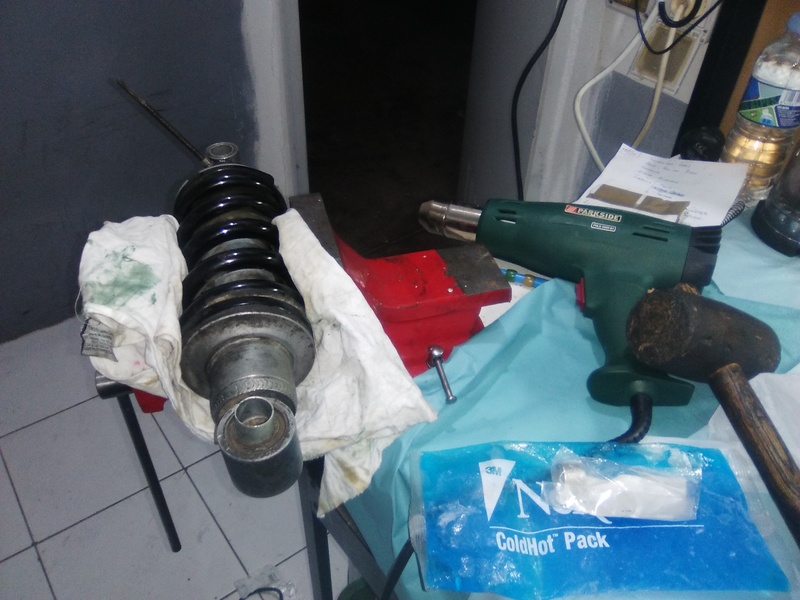 On the other side, I have contributed with parts that I already had, the advancer, the carbs diaphragms (at the end I replaced the repaired originals), the KN filter, lots of SS screws and nuts, the rear subframe.. that it is not included at the grand total. The labour hours are debatable. It is not the same work fast inside a budget to finish a project to make business than making relaxed, enjoying and with music at home in my free time. It could be estimated that I've delayed about a 20% plus over a professional workshop… but, how much could be valued that everything is carefully checked & tested, the cables by its places, with good screws and to quality replacements?. More than FJs are bikes that I know perfectly and know everything needed and how to do it. So I consider on balance referred to a professional workshop in labour hours, 115. First surprise: moving the bike side to side with my 3CV, it feels incredibly heavy, ssurprisingly because the 3CV looks bigger for its greater fairing. Yamaha declares more weigh for the 3CV model, 252 kg. with full fuel, instead of 1TX 236 kg. But the modern rims fitted in my 3CV I think made the difference: the 1TX OE rims weigh much more. And more in my 3CV, with a SACS GSXR rear instead of the usual Exup fitment. It is said that taking away 1kg. of not suspended weight to a motorbike is equal to 10 kg. of suspended weight. Well, moving the bike pushing on the home garage feel like that. Plus more weight situated low on the bike means lower gravity centre that cost more energy to move. Starting the bike the sound is AWESOME with the OE exhaust pan and the open XJR cans, much better than my 3CV with open exhaust pan and the same cans. Pure melody! Just leaving riding the 1TX, feels more heavy at low speed (again for a heavier front rim? 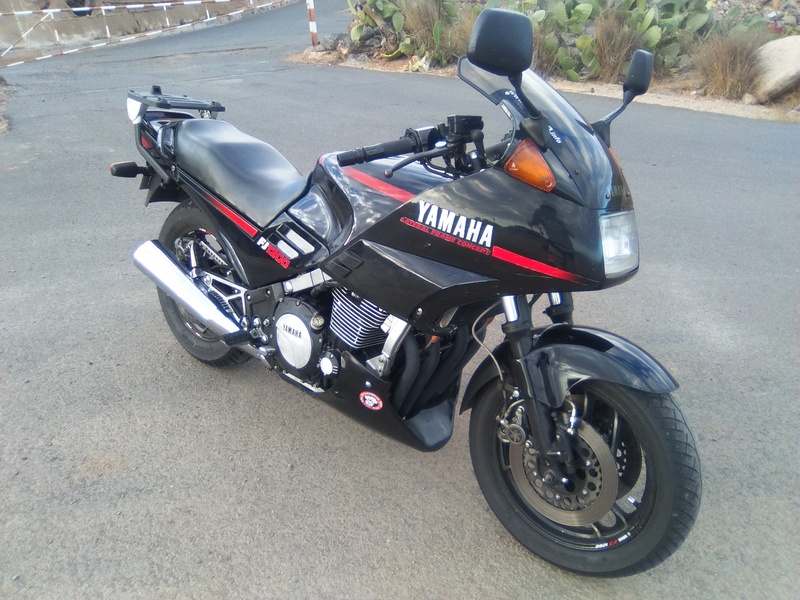 ), but this feeling disappears when picking up speed and the bike and the bike moves from side to side simply stepping on the footpeg, but still giving a ponderous feeling. What a fantastic engine the FJs have!. Sweet, powerful, progressive and with power to spare in any circumstance. This engine delivers power even at idle!. You have power at hand, always available, at any speed and in any gear. Certainly if anybody needs more power when riding on open roads or is mental insane and he is a danger for himself and the rest of the road users o must go to a closed track, but just now!. This engine is so good that it is still in production today, even though it is limited and it is less sweet with the injection and the latest anti-pollution rules. Go from zero to the red line with absolutely cleanup, without hesitation, indifferent to the gear selected. It is possible leave 3er gear on and being concentrated in driving only opening and closing the throttle on a slow curve road, or leave in 5th gear all day on like an automatic vehicle in a long riding journey. And how my 1TX handle with near OE equipment?. Well, incredibly fine: that you can go out to a ride with modern motorcycles with something built on 1.986 without complexes I think it says it all. With OE suspensions, standard tires and brakes improved, the bike is very agile in very tight curves with its 16 "rim. No, nothing at all about the bad reputation of these rims. 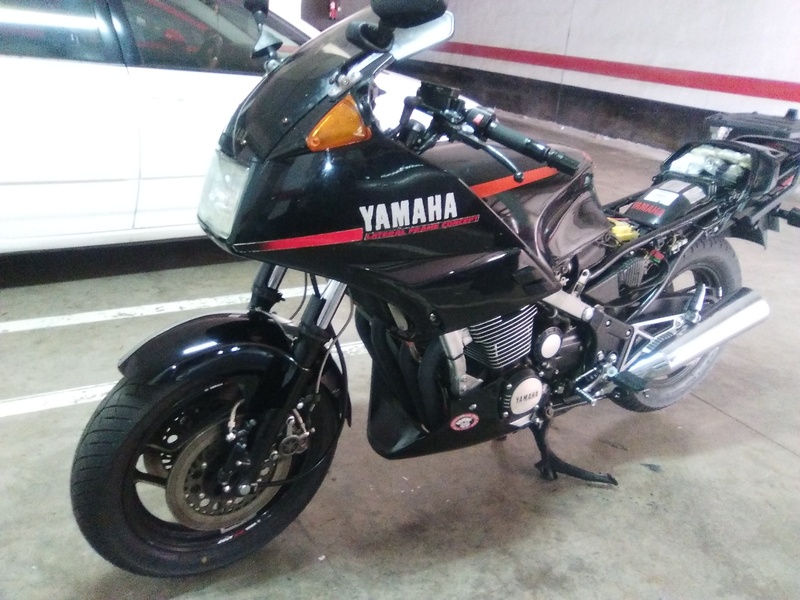 I have owned 3 bikes with 16" rims at front and if everything is in good shape and working, the bikes feel fabulous, lying down with only a look to the apex, and the changes from side to side are magical. At first, the settings on the refurbished suspensions were dialled approximately, having my 3CV at side, and were perfect carefully settled riding side to side with the fabulous Mingo's 1TX and changing from bike to bike. 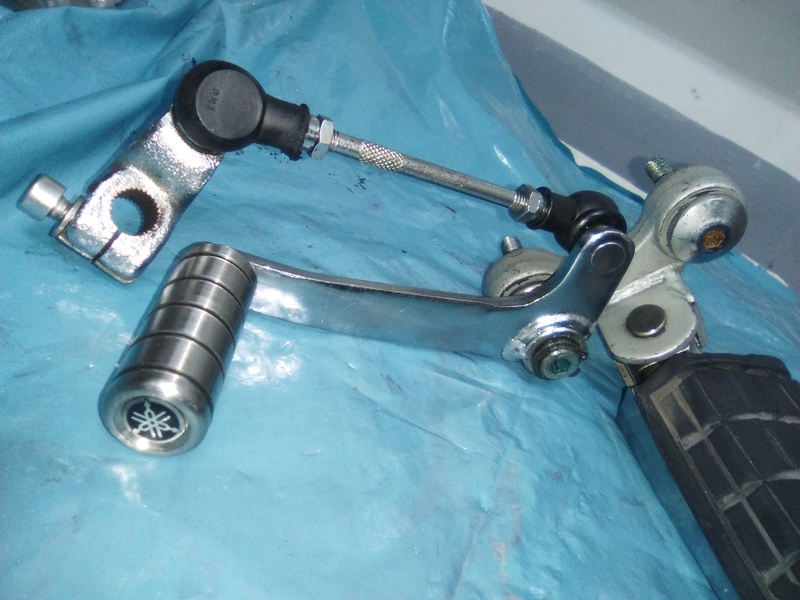 Rear suspension: in OE settings, both, hydraulic and spring, in the 4th position. Even with radial and modern tyres and standard and lighter 17" rims, my 3CV don't change side to side as fast as this 1TX with 16" front and narrow (for today) 150 rear tyre. At very high speeds the 3CV feel more planted and with more stability, with train-aplomb given for the radial tyres (no, it is not due to a more conservative geometry. The 3CV rear is matched with shorter dogbones). But we are speaking about jail-speeds in the world of today. So, I'm not so much cared for. I'm very proud of my work in this FJ. More due to this poor bike were to be dismantled and sold for parts. I'm not proud only for the final finish, so by the fantastic ride that it offers, and this is the most important thing to me. 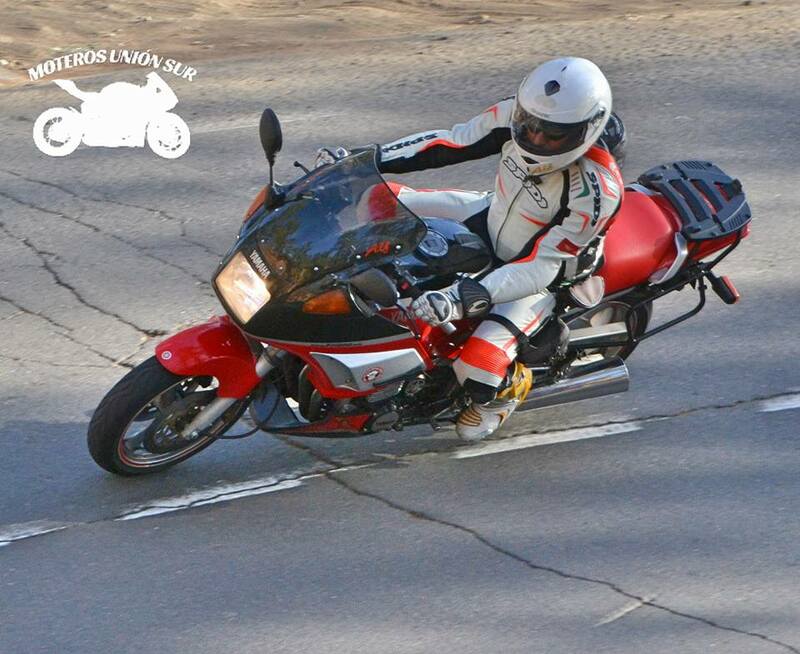 My FZ750 or CBX 750 worked perfectly, but the FZ was not so comfortable and my CBX lacks power and mainly, brakes. And it is not as easy improved as the FJs or FZs on this department due to the strict road rules on vehicles in Spain. Side to side with my cared, moded and fast 3CV, and I speak with chronometer in hand, is so fast as she. The little differences uphill or downhill or in tight roads were more due to a traffic circumstances that due to any particular bike factor. I think that in more and fast open roads, the 3CV will impose its more effective engine and tyres. But again, we are speaking about jail-speeds. Ah, but you make the comparison with another FJs - you object!. 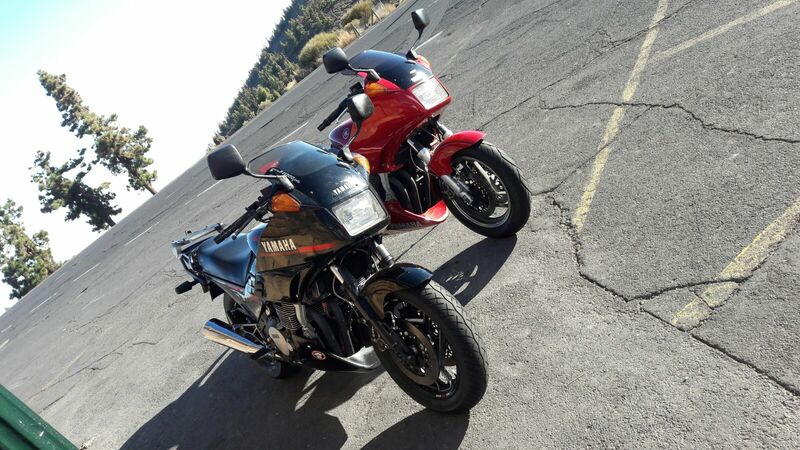 Months ago, thinking about what bike to choose and then with the mind open to any model (except those that I must NOT to own because I can kill myself, like the Triumph 800 XC, not for the bike, if by myself, because I know how fast I could ride that bikes and it is insane on open roads) I exchange bikes with an FJR 1300 owner. 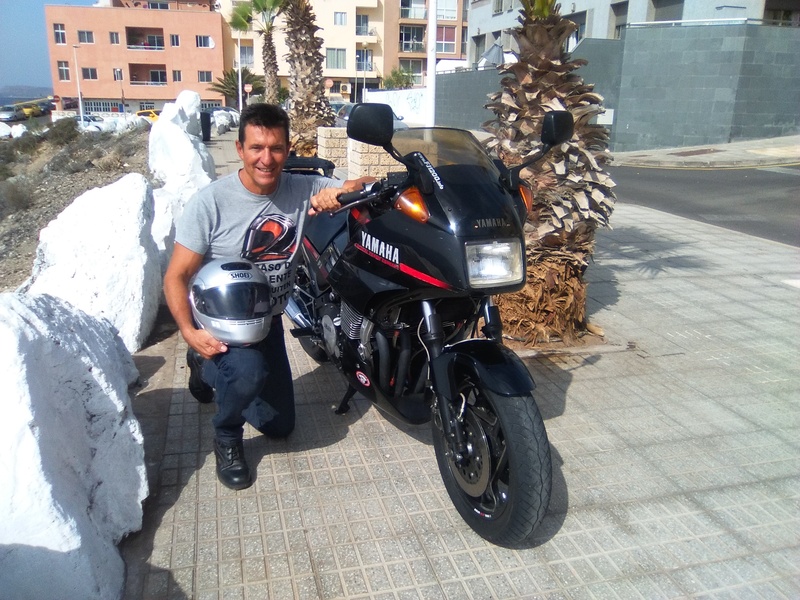 The FJR give me not so confidence like my 3CV and it give no impression of so much power thought the rpm dial (yeah, of course, because it is not your bike that you're adapted to!-you could object!) well, right... until the FJR owner riding my bike near ripped the stickers of my bike overtaking me brain out riding my FJ following a GSXR 750 K5 in a fast and open road, in theory the kind of road for the modern FJR being designed to. Completely impossible follow its rear wheel mainly for soft and unmatched suspensions, weight and general volume of the thing. It is a hard work to make a vehicle complete restoration or refurbished. 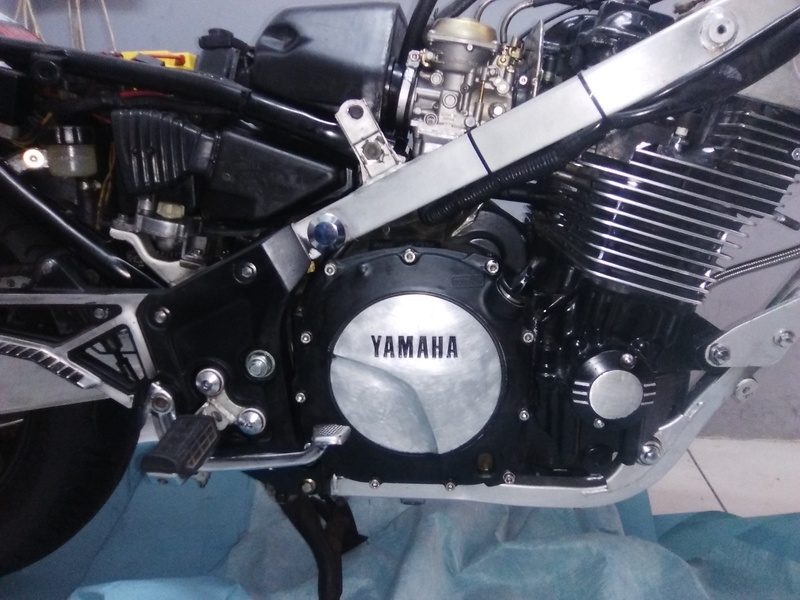 It is necessary do it for passion for this model, for your youth dream or whatever the particular reason, in my mind because no other motorcycle give more cent for cent that my FJ... except another one!. And don't make a plan or a budget. Always it will be more expensive! But the motorcycle is love. And this is not a valuable item. The personal satisfaction of riding YOUR BIKE, made by you, different to any other bought in a shop... there are nothing on motorcycling compared with this. At least for me.